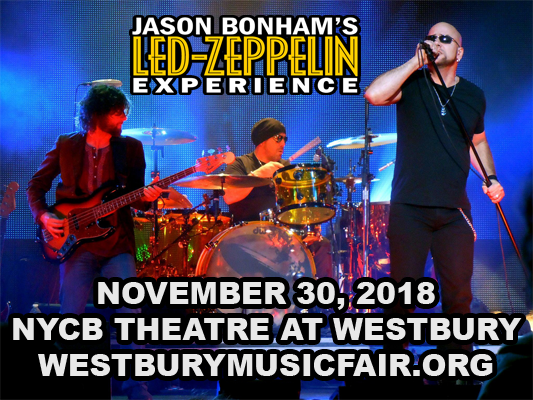 Capturing the raw, magnetic essence of a Led Zeppelin show, Jason Bonham brings his Led Zeppelin Experience to NYCB Theatre at Westbury on Friday 30th November 2018! The closest opportunity you'll get to seeing the iconic rock band live, Jason Bonham's Led Zeppelin experience is everything you could possibly want from a tribute show and more! Pitch perfect and thoroughly entertaining, if you're a Zeppelin fan you won't want to miss this show! Son of the late Led Zeppelin drummer John Bonham, Jason Bonham is also a successful drummer, who has dedicated his career to continuing his father's legacy. First learning to play at the age of four, Bonham began his career in 1985 when he joined British rock band Virginia Wolf, performing with the band for three years until their break-up, making two albums with them and touring the US with them in support of British rock supergroup the Firm. In 1988, Bonham worked with Jimmy Page, former Led Zeppelin guitarist, on his Outrider album and subsequent tour. That year, he also appeared with the three surviving members of Led Zeppelin for a performance at Atlantic Records 40th Anniversary concert in New York City. Seven years later, Bonham represented his father when Led Zeppelin was inducted into the Rock and Roll Hall of Fame, and two years after that he released a tribute to his father; a live Led Zeppelin covers album titled In the Name of My Father – The Zepset – Live from Electric Ladyland. In 2007, Bonham took his father's place in a rare Led Zeppelin reunion concert. This led to Bonham teaming up with James Dylan in 2009 to create Jason Bonham's Led Zeppelin Experience, a live homage to his father's band.